CHATTANOOGA, Tenn. – In the face of harsh corporation opposition, skilled workers at the Volkswagen plant here have voted overwhelmingly for the United Auto Workers (UAW) to become their collective bargaining representative. This is just the first step toward unionization of the whole plant. The corporation fought the workers by hiring a union-busting law firm, trying to prevent the vote from taking place, and running a scare campaign that included a corporation-backed bogus union. Nevertheless, the 152 workers voted by 71 percent for UAW Local 42 in a two-day election Thursday and Friday. They maintain robots and other machines at the plant. Under Volkswagen’s new Community Organization Engagement policy, UAW Local 42 leaders have been representing workers at meetings with the Chattanooga plant’s human resource department and at the Volkswagen Chattanooga executive committee. However, when the group of skilled workers exercised their right to call for an election for collective bargaining rights, the corporation objected. It filed an appeal with the National Labor Relations Board (NLRB) to block a vote. The NLRB turned down the corporation’s objection to the workers holding a vote and they chose collective bargaining. Last year an NLRB election was held plant-wide. Tennessee’s right wing elected officials, including Gov. Bill Haslam and U.S. Senator Bob Corker, issued a series of anti-union tirades as did the U.S. Chamber of Commerce and outfits such as Americans for Tax Reform. As a result, workers lost an opportunity to have collective bargaining protection. 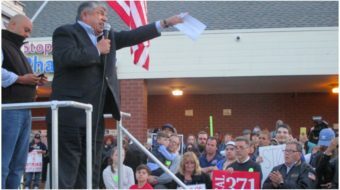 Pro-union workers continued to organize, however, and formed Local 42. Meanwhile, Volkswagen hired a legal firm that specializes in undermining workers’ rights to form a union. 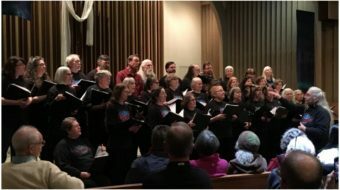 Moreover, the corporation recognized an organization called the American Council of Employees (ACE), which was formed by those who opposed unionization in the plant-wide election. ACE joined the corporation in trying to block the vote by skilled workers. When that failed, its representatives tried to convince workers that unionization “at this time” might do great harm to Volkswagen because the corporation was recently caught rigging some of their cars to falsify results on pollution emission tests. Workers at all Volkswagen plants around the world, except the one located in Chattanooga, have had union collective bargaining rights and protections for many years. 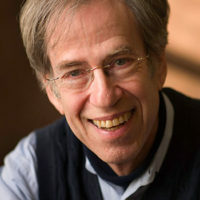 Lemb noted that collective-bargaining negotiations conducted in a “constructive and cooperative manner” could benefit both employees and the corporation. 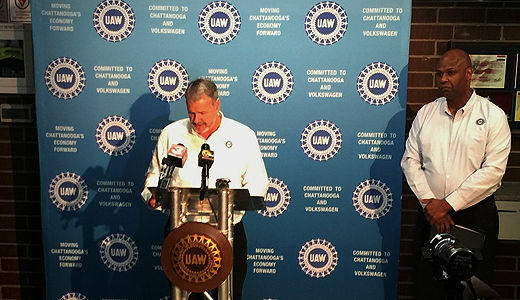 Mike Cantrell, Local 42 president, said, “a key objective for our local union always has been moving toward collective bargaining for the purpose of reaching a multi-year contract between Volkswagen and employees in Chattanooga. This past September, workers at Commercial Vehicle Group, Inc. in Piedmont, Ala., voted 89 to 45 for UAW to become their collective bargaining agent. Photo: UAW Local 42 President Mike Cantrell and UAW Region 8 Director Ray Curry speak to the media.